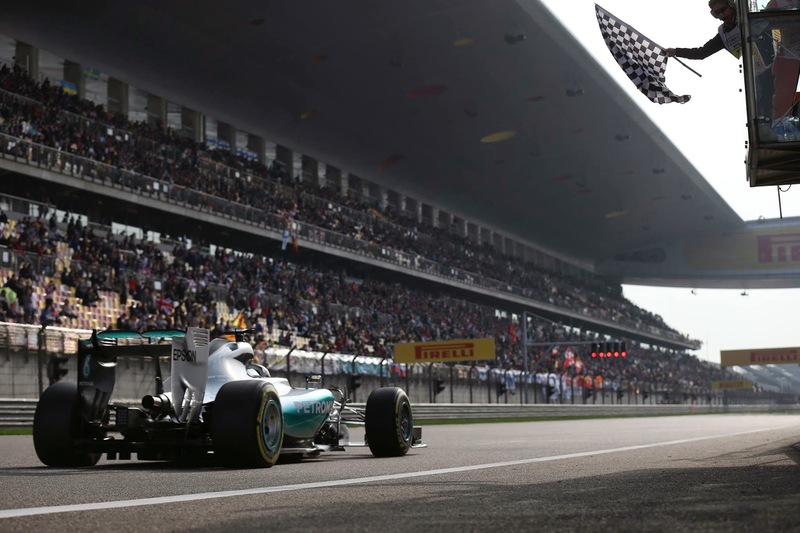 As expected, Mercedes was back on the top steps of the podium in China after that stinging defeat at the hands of Ferrari and tire wear in the Malaysian heat. The only surprise perhaps that it was able to do so using the softer, option, tire. 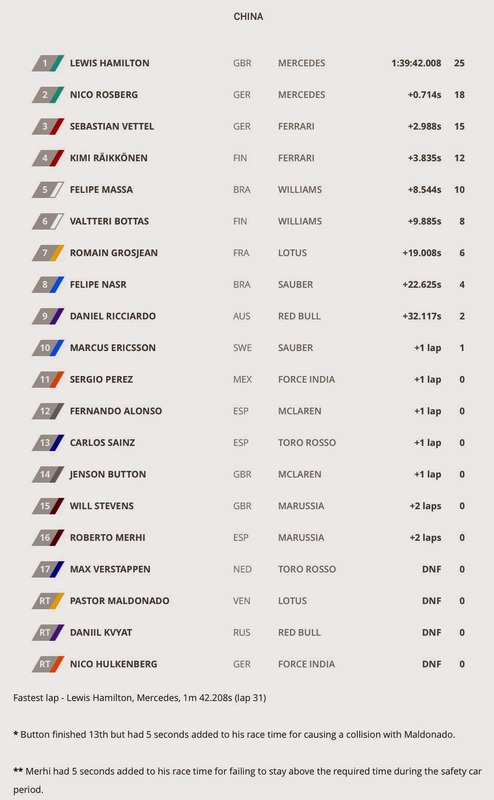 Third place for Vettel just ahead of Raikkonen. 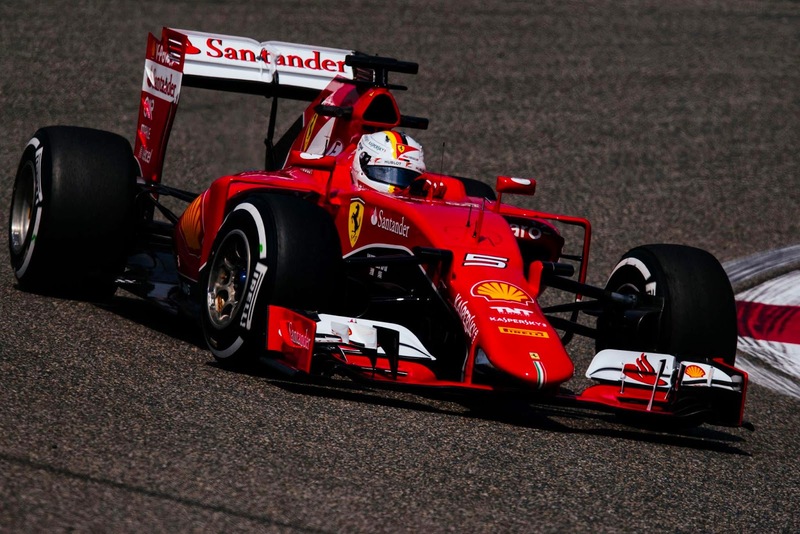 Three races in and Ferrari has already scored half the points it had for the whole of the 2014 season. Fair to say they under promised and over delivered so far. Arrivabene will have to carefully manage expectations but it's clear that, for the first time in years, the Scuderia is not on the back foot. One feels for Fernando but you must wonder if there was something toxic in the mix or if it is simply the case of all the pieces finally falling into place. From the outside we will never learn the whole truth but perhaps Raikkonen's pace against Vettel this year is a key. 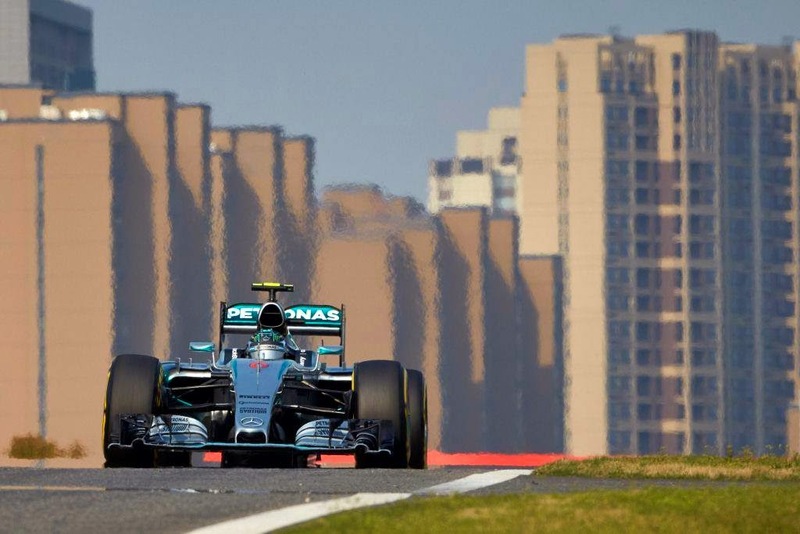 Hamilton's victory was a result of qualifying. He made sure at the start to cut in front of Rosberg because he knew clean air was the key to making the tires last. 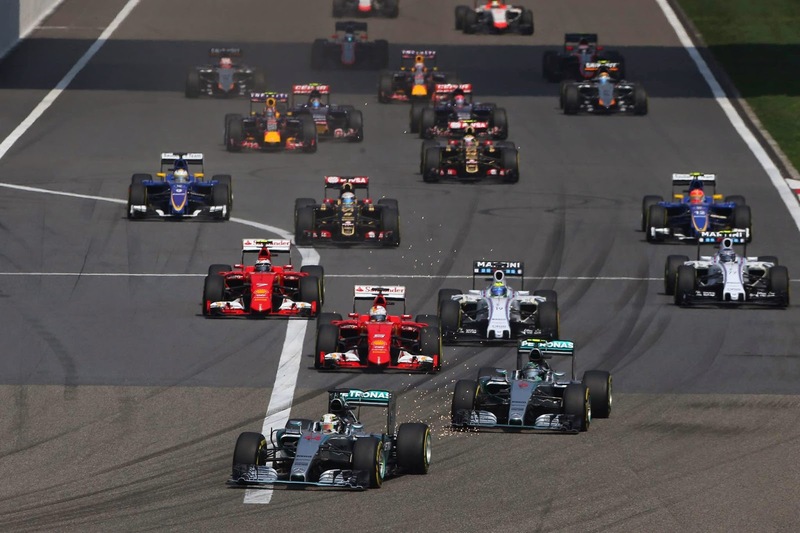 When Rosberg pushed him, Lewis backed him up into Vettel, compromising both their performances to an extent. Strategically, a good move. Had Nico done it you can be sure he would have been lambasted for playing dirty. On the other hand Hamilton would probably just have passed him on track so, while it's a shame F1 still has not figured out how to make aero regulations that allow cars to follow each other closely, Rosberg's post race bitching will just enhance his sanitary napkin wearing reputation this year. Don't hate the player, hate the game Nico. If you wonder why Mercedes did not split strategies and have Rosberg go long on primes in the middle stint, well maybe there's a reason Hamilton has been delaying signing his contract and talking so much about Ferrari lately. Now the pattern is now pretty much set, more so if Ferrari continues to pressure. It must be incredibly frustrating for Rosberg. Star of the race: Verstappen. Anyone complaining about young kids with "little experience" coming into F1 forget Raikkonen, world champion or Vettel, four time champion, both had "little experience". Proof is in the pudding and it's clear Max will be in a top team in two years or less. Unfortunately, Verstappen verstoppen right in front of the packed grandstands with four laps to go. It was his second engine related retirement in three races. Clown show of the race: Button. Unless all the drivers made a deal that they would take turns punting Maldonado off the track this year and it was Jenson's turn. I wouldn't call Button 'clown' of the race - 'Clown move', maybe... There's still no conclusive camera angle to show Maldonaldo didn't move under breaking (he definitely seemed to dive for the corner very late) and it was on the back of 2-3 good laps of racing. It was just a bit, well, clumsy. I can't get enough of the idea that all of the drivers meet behind Maldanado's back to determine who will punt him off the track this race. Maldonado called about brake failure, didn't he? I wondered if maybe that affected the interaction between him & Button when JB clipped him. Rory Byrne is still there and has had a hand in the 14T and 15T. The engine is frozen so the basics are still those designed by Marmorini. so what's changed must be the balance of priorities in the design. i would say its more of things falling in place, calling for compromised engine for better aero philosophy cannot be attributed to fernando. I always said ferrari would be better once they sort their engine out, there was too much to gain just by correcting the mistakes like bigger turbo, lighter engine , exhaust insulation i would argue that itself IMO can give considerable gain and they had serious ERS issue as well. All the 5 years they had wind tunnel issues, which were solved mid last year, so they been bringing in negative developments to track last 5 years. Even Aldo costa suggested WT issues were main reason for ferrari's struggle. But those choices were made to favor aero gains that never proved themselves on track. exactly, even if they worked the philosophy is flawed in the first place. Also, exhaust n ers issues are mistakes they made, they are not working as intended. I was just saying that if you are attributing "toxic" to alonso, it has nothing to do with him. Or if Pastor was braking early due to braking issues and it caught Jb out. Still a funny one to watch.